Ryan Shares Two Tattoos by "Brooklyn P"
I often wonder how may Tattoosday encounters would have been lost had my apartment come with its own laundry facilities. I raise this point because, yet again, I met someone cool with tattoos at my local laundromat and he was generous enough to share his ink with us here on Tattoosday. 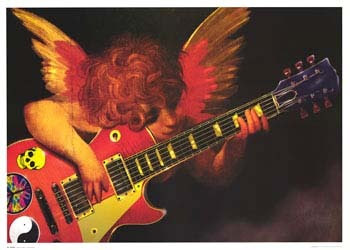 In fact, Ryan, who is this particular contributor, and I share a common bond, which is that we have both been tattooed by the same artist, Peter Caruso a.k.a. "Brooklyn P," who originally shared his work with us here on the site way back in 2008 here. This pin-up girl is classic old school Brooklyn ink, based on flash by the legendary artist Tony Polito. Brooklyn P is an admirer of Polito, and even shared a piece that Tony did on him here. Ryan estimates he has about fifteen tattoos in all. My tattoo from Brooklyn P is documented here. 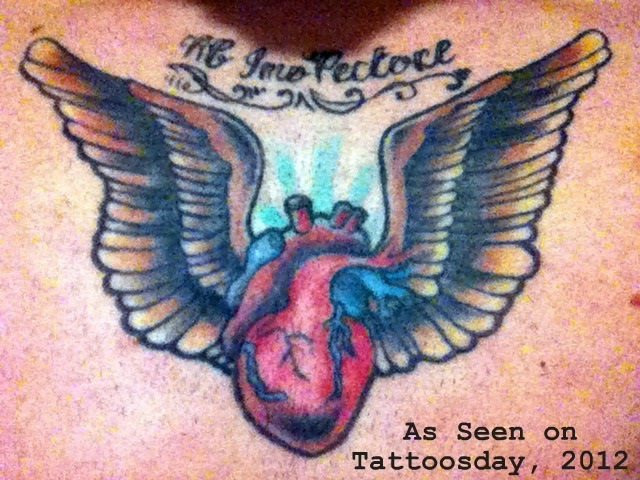 Thanks to Ryan for sharing his tattoos with us here on Tattoosday! And thanks again to Brooklyn P, who continues to work hard at keeping that old school style of Brooklyn tattooing alive! Today my daughter Shayna had her bat mitzvah. In honor of Shayna, and in light of the rabbi commenting on angels and cherubim during the service, my sister Alicia suggested I repost my second tattoo, in honor of my youngest daughter. You may recognize this from the bottom of the page (or for long-time readers, it once served as the masthead). 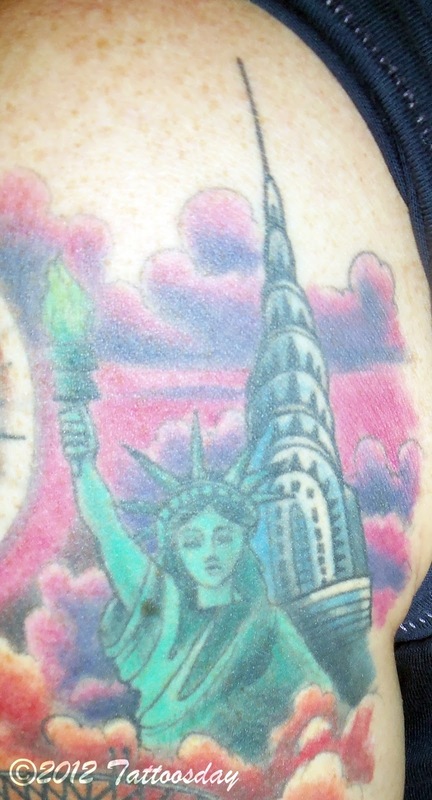 This is my second tattoo, inked in July 2005, by Peter Cavorsi at Body Art Studios in Brooklyn. 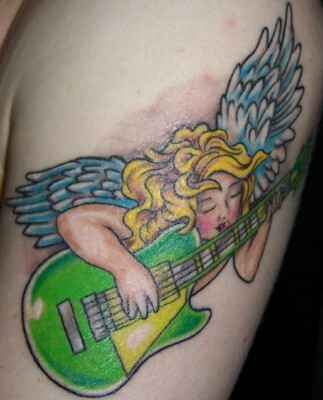 I brought him this art as reference, and he ran with it, customizing it to more closely reflect my younger daughter's blonde hair, and her affinity for Green Day, at the young age of six. Call them what you will, what I will go with is “Orphans”. I have a handful of posts that have lingered “on deck,” so to speak, that are, by themselves, sad little bits that were never completed, or, for whatever reason, didn’t pass muster with Tattoosday’s editorial board. However, by packaging them together, I can cross them off my list once and for all, and move on. A Spring Cleaning, if you will. 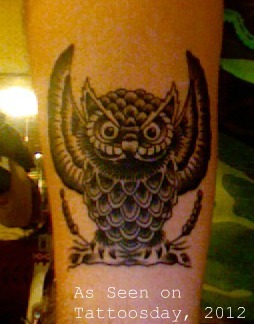 I asked him if he could send me a better photo of this pretty awesome owl tattoo. I asked again at the end of April, and again at the end of May. I followed up again in October, at which point Jonathan said he would send me a new photo soon. 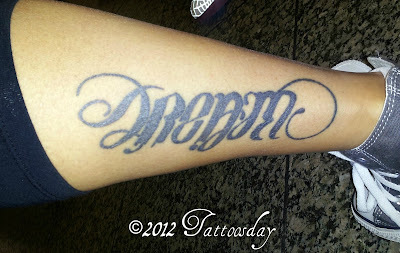 Look, things happen, and I hardly see Tattoosday as the center of the universe. There comes a time, however, when I’m going to have to assume that it’s fallen by the wayside, and move on. This means, of course, that Jonathan will email me a crisper photo tomorrow. The reason I balked at posting this originally was because the piece is a cover-up of a cross, and the original tattoo is fairly visible in its new incarnation. I was concerned that a stand-alone post would incur the wrath of the tattoo purists and the story that this was a memorial piece for Nick’s grandfather would be lost. 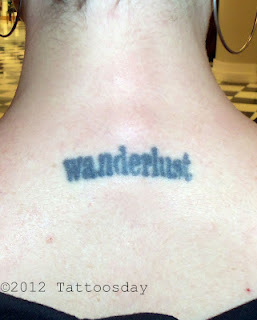 Thus, it ended up in Tattoosday’s home for Orphan Tattoos. Thanks to Nick, nonetheless, for sharing it with us. We met in Penn Station a couple of weeks ago. I finally got some pictures of a couple of my tattoos. Both of these were done by Krista at Empire Ink in Akron, OH. The pin-up girl was drawn by my grandmother when she was 16 for my grandfather while they were dating. The other was an original design. The Latin quote at the top of the heart is a quote from Julius Caesar. It translates to "From the bottom of my heart". Thanks for the interest in the tattoos and letting me share. Honestly, I don’t know why I didn’t post these originally. As time passed and the e-mail traveled to the bottom of my inbox, it became an out-of-sight, out-of-mind submission. Thanks to Johnny for sending these in originally, and for waiting so patiently to see them appear on the site. At the end of June 2011, I met a woman named Christina in Penn Station, whose ink did make the site a couple months later, here. At the time, she was accompanied by two other people, one whose name was Damion. 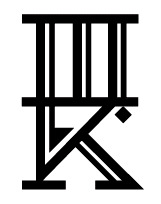 I took a picture of Damion’s tattoo, but it never made the site, until now. Part of the reason Damion’s work never went live was due to the fact that it is an unfinished work, an orphan in more ways than one. Here’s the shot. Damion loves these wings, calling them his “prize possession”. Why are they unfinished? 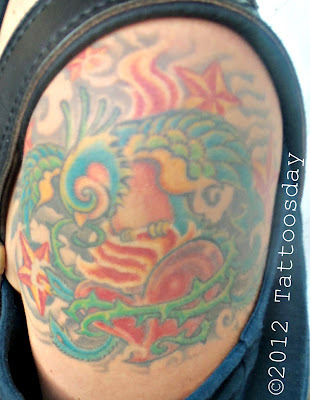 He credited the artist Carlos Alfonso at Rising Dragon Tattoo, formerly located under the Hotel Chelsea on 23rd Street. But, Damion informed me, Carlos passed away. It’s not so easy to have another artist finish the work of a deceased tattooist. Damion’s not the only one who was so affected, as you might imagine. 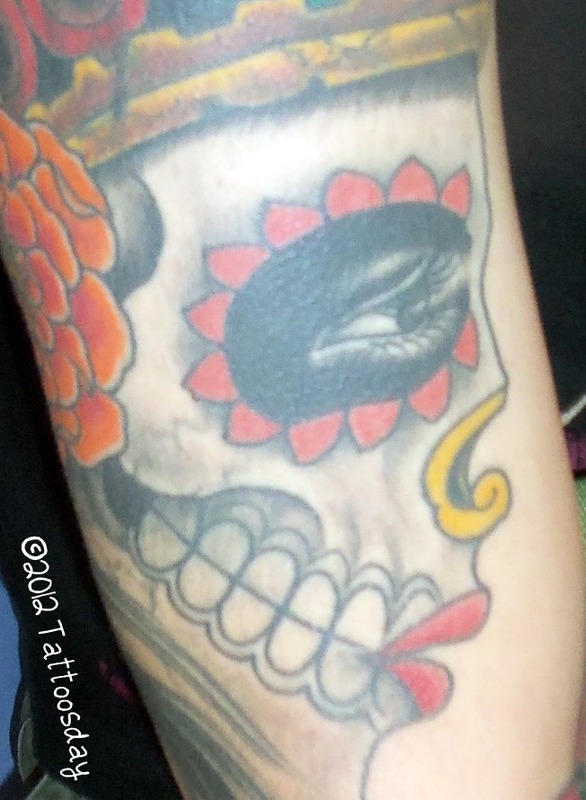 The story rang a bell with me, as I had also featured Carlos’ work in a 2009 post with the ink of performance poet Jackie Sheeler here. A belated thanks to Damion for baring his back and showing off his wings in Penn Station! As summer waned, I had a couple of unsuccessful encounters in September, in which the quality of the photos I took were substandard, and e-mails to the contributors went unanswered. In a weird twist of this orphan post, the Tatudharma web site indicates that the shop is closed permanently, a result of it having been firebombed last April. The artists can still be contacted through the website, however. The host of these pieces is Lindsey, a Southern Californian who had both tattoos inked in San Diego. The plant was done about 8 or 9 years ago by an artist named Alethio. The bird on her other arm was done by Gary at Ace Tattoo. “That was the beginning of a sleeve that never happened,” Lindsey said with a sigh. Thanks to Chris and Lindsey for sharing their tattoos and for hopefully forgiving my camera for betraying them. Jen acknowledged that it wasn’t done very well, but she said she had a good reason for getting it. I did send an email as a follow-up, but more than one reeks of desperation. Maybe one of these days Jen will find my card or flier and finally e-mail me back to explain what wanderlust means to her. Until then, we’re left with this orphan. Believe it or not, we still have a few 2011 photos left in the tank, but this entry takes out a good chunk of our backlog. Thanks for giving these orphans a home, even if its just for a minute or two. Occasionally I will post a handful of items that came my way, in one form or another, that may be of interest to our readers. For example, the other day my mother-in-law gave me a clipping from the New York Daily News that appeared back on Sunday, November 2011. 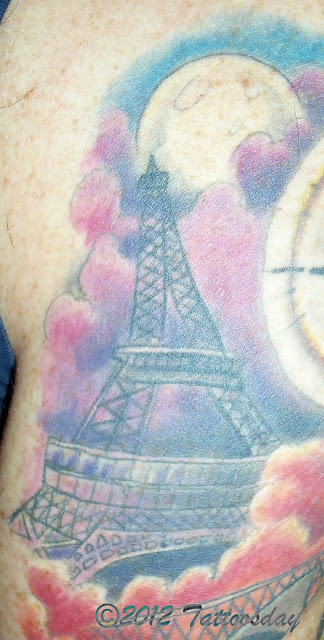 Michael McLeer of Brooklyn Made Tattoo on 93rd St. in Bay Ridge, Brooklyn, designed the label for the new Beaujolais Nouveau and has his vintage 1976 Cadillac decorated the same way. Readers of Tattoosday and/or residents of Bay Ridge, Brooklyn, where we are based, will recognize "Kaves," as he is known. I first encountered his work back in 2008 here and, last May, he shared a piece on his own canvas, a portrait by Mark Mahoney here. Kaves is a true artist on multiple fronts, and the photo above showcases his latest project, a wine label he designed. Read more about him and his Beaujolais in the full article here. Speaking of Valentine's Day, I missed the opportunity to post this love-related tattoo video. Needles and Sins beat me to it, but I'll share it anyway. That's from Brooklyn comedian Boris Khaykin. Pretty funny! 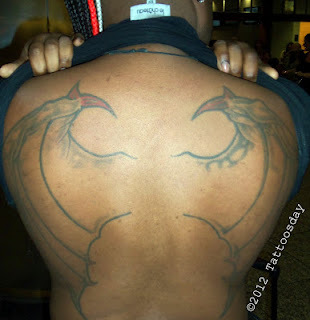 Normally, I like to stay positive on Tattoosday, so I've avoided posting all those "10 worst tattoos" lists and other such web features that mock the less-fortunate in the inked nation. However, this link, is actually pretty clever. 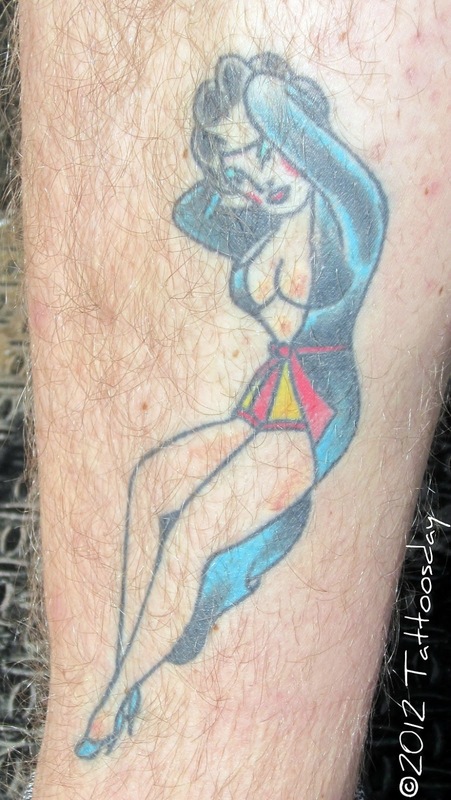 It's called "10 Horrible and Unexpected Tattoo Consequences" and can be read here. Writer Molly Mahan elicited several chuckles from this here jaded inkblogger. Besides, you can learn a bit about " the first case of nonischemic priapism following penile tattooing". That's worth the price of admission right there. This post is a straggler from 2011 and readers may wonder why it took so long to appear here on the site. Unfortunately, I don't have a lot of information on it, as I snapped this on the subway one evening last June, and I wasn't able to record a lot of details. 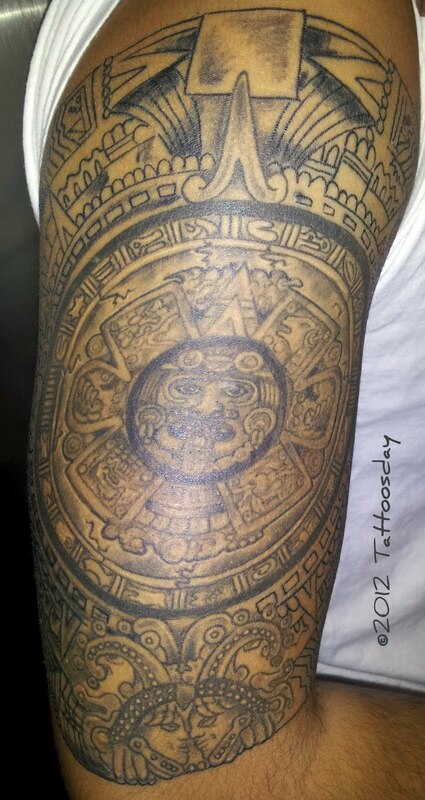 This is what I do know: the host of this tattoo is Ivan, and the piece took 2 sessions and approximately 15 hours to complete. The talented artist behind this is David Sena from North Star Tattoo in New York City. Unfortunately, there's not much more I can provide in terms of what went into the work, but the quality of the tattoo speaks for itself. 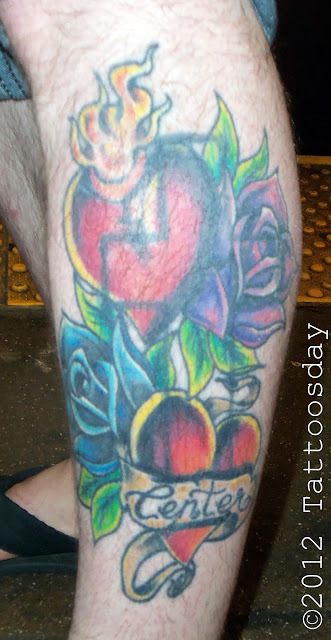 Thanks to Ivan for allowing me to snap these shots on the subway and consenting to sharing them here on Tattoosday! This sleeve is a collaborative effort with Dmitry and his tattoo artist, Gene Coffey, from Tattoo Culture in Williamsburg, Brooklyn. He explained that he has spent a long time working on it, and that it is based on a animated series called Invader Zim, which was created by Jhonen Vasquez and originally aired in 2001. Dmitry told me "I've always been a big fan of [the show] and I've always loved the artwork." He brought Gene "a few pictures from the show and we put together the piece". The bottom section of the sleeve features other characters from the show, as well. There's a whole catalog of the characters from the show listed here. I'd venture to try and identify every one seen in Dmitry's canvas, but I would most likely misname one or two. He told me the show has achieved a kind of cult following so, if any fans would like to add comments below, feel free to do so. Thanks to Dmitry for sharing his fantastic tattoo sleeve with us here on Tattoosday! Jon Paul's focus on Poptimistic is travel and food. He credits the work to the artist Friday Jones, who does custom tattoo work out of Senses New York Salon & Spa in the Flat Iron District. 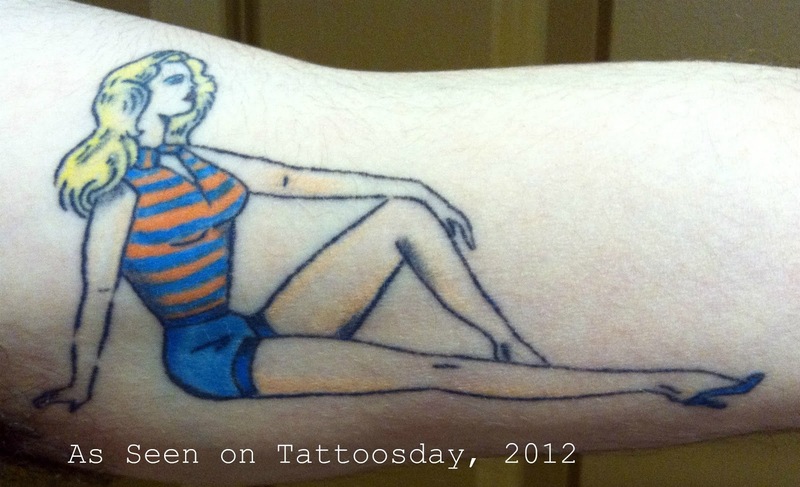 I mentioned Ms. Jones back on Tattoosday in 2009 here. Jon Paul explained that he originally met Ms. Jones in New Orleans when she did "the very first tattoo [he] got ... the compass that the rest of the tattoo is built around." About a year later, he elaborated, "I went back to her and said, 'Now I want you to build a whole piece around my three favorite spots in the world.' So she designed it custom from that." She did it over three sessions. The Big Apple is represented by the Statue of Liberty and by the iconic Art Deco style of the landmark Chrysler Buillding. Jon Paul said " Sydney I love just for the sheer beauty of it and the people ... are lovely." 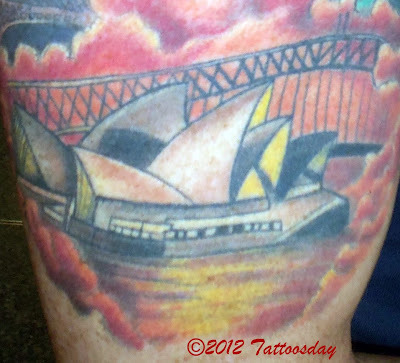 Jon Paul elaborates further on why he loves Australia in this post, which includes another photo of his tattoo. 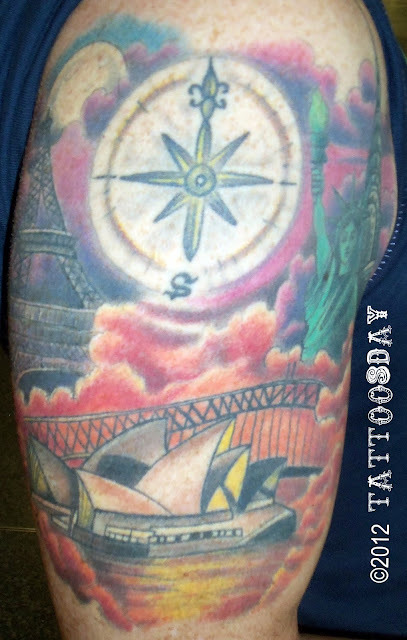 Thanks to Jon Paul for sharing his tattoo with us here on Tattoosday! 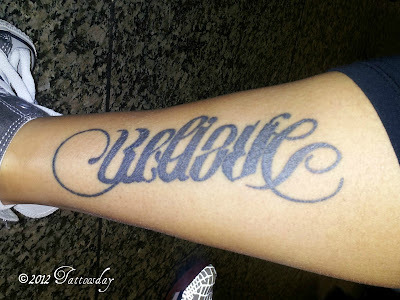 This is an ambigram, which is a design that reads differently, depending on the way you look at it. It appears as the word "dream"
Kristina credited an artist named Scott in Farmingdale, New York. I will take a leap and assume this was done by Scott Trerrotola at Tattoo Ritual. 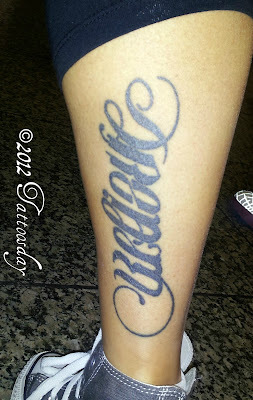 It should be noted that Scott recently opened a new shop in Bellmore called Alchemy Tattoo Arts. The artist is otherwise unknown. Thanks to Kristina for sharing this, one of her four tattoos, here with us on Tattoosday!